DB Cargo and Cemex have opened a ‘pop-up’ depot at Warrington, designed to serve the North West construction market and reduce the number of HGVs operating in the High Peak area. 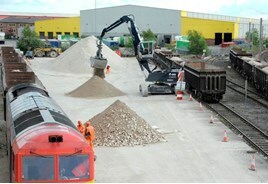 The depot was installed in weeks on land next to the West Coast Main Line, using a ready-made weighbridge and office. It will handle around 125,000 tonnes of aggregates per year. The material is transported from Dove Holes Quarry in Derbyshire on two weekly trains, with each carrying around 1,540 tonnes. This removes up to 150 HGVs from the roads. “A pop-up rail depot can be installed in weeks rather than months, and gives the flexibility to move aggregates from quarries to areas where they are needed, especially in the short term. So with the right piece of land close to the rail network you can create a depot,” said Mark Grimshaw-Smith, head of Cemex Rail and Sea. GBRF might have something similar at Ashton in Makerfield (just north of Warrington). There's a wtt run planned to depart weekdays @ 20.33 to Hardendale Quarry and arrive back @ 0717 the following morning. Only appeared this week so not seen it yet. But they are selling all the spare railway land for housing ! Oh dear ! Has someone told Network Rail ? Yes the spare land, not the land with track on which might potentially be used again. You mean this land above on which the track was relaid quickly to create a depot at short notice ? The track doesn't look new, the pad where the stone is being piled looks freshly made. Eureka, found it, use google maps, Warrington then go north from Bank Quay until you find Folly Lane crossing the WCML, that's where they are. Another bit of useless information, the tracks are what used to be the entrance to Warrington Dallam Shed donkeys ago, the industrial units are where the shed used to be.